Goleta fireworks were great. 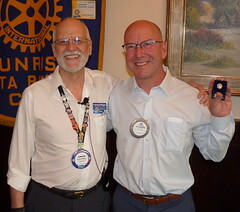 Good job, Rotary Clubs of Goleta. Involvement signup sheets: Those who have not submitted the involvement sheet should sign up and hand it in to any board member. The District Conference will be Friday, October 3, through Sunday, October 5. Monterey Marriott, 350 Calle Principal. Information at www.seemonterey.com/rotary. 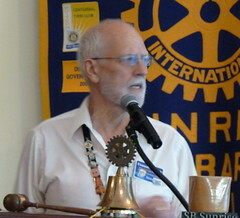 Register soon at www.rotarydistrict5240.org. Group 8 Social will be Sunday, September 28 from 12:30 – 4:45 PM at the Santa Barbara Polo & Racquet Club. RSVP due by Sunday, September 7. $30 for people 16 years of age and older. $16 for people 5 to 15 years of age. Only pay if you go, but need RSVP in advance. Rotaract Club of Santa Barbara Miniature Golf Tournament will be September 13. It will benefit the SB Courthouse Legacy Foundation. Next week’s duties. Greeters: Ted Deck and Darren Doi. Invocation: Tim Durnin. Flag Pledge: Tom Putnam. Raffle: Fred Gaeden. Sgt. At Arms: Sandy Grasso-Boyd. Andy Doerr provided a Fiddlers’ Festival Update. Encourage all members to get involved with the planning and fundraising of the Fiddlers. Kim Horn has taken the lead on fundraising, so please help her out. Gary Jensen and Andy Doerr have been working with the Goleta Valley Art Association. The planning committee met a month ago and everything is progressing forward. Think about how you want to be involved both in planning and on the day of the event. It’s ok to bring friends aboard to help with ticket sales, food sales, etc. It’s a family event and wonderful opportunity to tour the Stow House. The festival is October 12 (always the second Sunday in October). Next meeting will be scheduled sometime next week or the following. 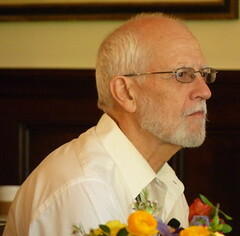 Tom Heath announced the international committee met yesterday and decided on its next trip to Nicaragua (9/18-23). Some people might stay extra days to tour the countryside. We would like to invite you all to come. There will be activities with local Rotarians and the community members. Our grant was approved for repairs to the two clinics. All the work will be started next week and will be mostly completed by the time we head down there. The people are wonderful and very warm. I also welcome any member who has not checked out the international committee to come learn more. Andy Doerr shared that the children’s choir that we support is touring, and they will be at Elings Park on Saturday, July 26. Little-Known Fact: This person was his/her high school mascot (a pirate) … Lucille Ramirez!!! Dana Goba shared a Weird Al video. Program: Bill Abel introduced Sherrie Fisher, the executive director of the MTD. He brought her to our club from the Carpinteria Noontime club. It’s important in transportation to be on time. Forty years ago, I moved back to Santa Barbara and applied to be a bus driver. I was told to put my application in a drawer with all the other women. It took nine months of interviews plus a letter from the government that reminded local transportation authorities to hire women. I was the first woman driver. The men I worked with were wonderful and welcomed me into the fold. At that time (1974) there were 19 drivers. Today there are 150 drivers. I really loved it. Your job ends when you leave work. You don’t have any paperwork to take home or anything to worry about. 1979 – I woke up with a spider bite. I couldn’t drive the bus that day because of the infection. I called in sick and said I can’t drive so I was offered the opportunity in the planning department to figure out routes. Soon after, the person in charge of that department left MTD and I was offered the role. Here was my chance to get into management. From there on, I raised my hand whenever an opportunity came up. I worked for a gentleman who believed you could do anything you set your mind to. In the early 2000s, I was the assistant general manager in charge of operations, risk, and HR. At that time, the GM had a quick retirement so I was offered the role. I enjoyed the next eight months and ended up with the job in the next 10 years. I have now been there 40 years and had a lot of wonderful things happen. When I wrote the employee manual in the ’80s, I thought I had covered all the things people could do. I was wrong! There is always something new and unexpected. We have many employees there that have been with MTD for 30 or 40 years. It’s a place people come and stay there. I will miss coming to work and seeing those people when I retire. Not going to work every morning will be, on one hand, tough, but on the other hand, very nice. I am looking for input how what I should be doing with my time. I will be going to Belize with my son and daughter in law. Then I am going to my 50th high school reunion. We are recognized as a transit system, per capita, as having the same usage of a city of 1M people. The fares only cover about 40% of what it costs to run. We receive extra funding from the federal government. I cared very much to be part of a job that makes a difference in the community. This fall we will have three articulating buses (the size of a bus and a half). The biggest issue we have is bus service from IV to SBCC. The students overwhelm the buses. Each trip has about seven buses running the route. We also have a lot of international students who like ride the bus because they come from countries where public transit is part of their culture. The bus company is looking at alternative energy. Diesel fuel is very expensive but we actually get it for a little over $3 per gallon because of contracts we set up. We have 27 buses that our downtown waterfront buses. They run purely on electricity. We charge them each night and they run for about an 8-hour trip. Soon you’ll see cities that can buy full-sized electric buses but that’ll take us a while to get there. Hybrid buses get about 12% better fuel buses. When I started in 1974, I joined the Teamsters Union. When I entered management, I was involved in negotiations with the Teamsters so I got to see the other side. I have a lot of respect for them. We had a two day strike once which was very tough. Every time we have a negotiation, we are threatened with strikes. We just got authorization from our board to spend $3.58M on an AVL project to see where the buses are. There will be apps available and riders can also get texts when their buses are arriving.